But I don't want to ask if I'm hungry! - Am I Hungry?Am I Hungry? But I don’t want to ask if I’m hungry! Do you ever think, “But I don’t want to ask if I’m hungry!” before you eat? Being a “resistance junky” in my own mindful eating journey, I found the secret to overcoming this. I realized that my resistance was tied to thinking, “If I pause to ask if I’m hungry, I might not get to eat the food that a part of me feels I must have right now!” For example, when I feel anxious (trigger), then I have a craving, then all of a sudden, eating a chocolate cake is the only thing I can think about. You know the feeling, right? It’s like a part of me is absolutely convinced, I MUST eat that chocolate cake! If a part of me believes that cake is the only solution, then I won’t want to do anything that might get in the way of me and my cake. So, here’s what I learned: What we resist persists, so as long as the end goal is to not eat, a part of me will resist anything that might prevent me from eating. When I give myself full permission to eat the cake, without guilt and without even a hint that first pausing to ask “Am I hungry?” might result in not eating the cake, my resistance falls away. In fact, I can even embrace that part of myself who believes eating chocolate cake is a good option in that moment. Without that resistance, I can put my focus on becoming curious about how I feel, knowing that after checking in with myself, I can still decide to eat chocolate cake if I want to. It helps me see that sometimes chocolate cake isn’t what I actually need or want after all. Notice that when resistance has nothing to push up against, it just falls away. I invite you to give yourself grace through this process. It is a journey and it takes practice, just like any other new skill. If you wanted to perfect your three point shot in basketball, you’d expect to miss many times before you consistently made the shot. It’s the same with mindful eating! Just keep practicing; it’s in the practice that the lasting change and transformation occur. Have you experienced resistance to asking if you’re hungry? Comment on this blog post to ask questions and share your experiences. I'm a Holistic Coach and Hypnotherapist specializing in inner healing and growth. I focus on guiding my clients to create lasting behavioral changes through re-patterning conscious, subconscious, and unconscious beliefs. My expertise lies in helping clients to reframe their thoughts that lead to self-sabotaging behaviors through the re-directing of the neural-pathways in the brain so new behaviors come naturally without relying on will-power. Through my own life experience, I understand the pain of not being able to feel in charge of your eating and hating yourself and your body. I know the deep challenges of being in this place. I was there too. I help my clients find understanding and compassion for themselves while reframing their experience of their relationship with food and their body. I have four children, ranging in age from 18 down to 10. I have been married to Tobin for 22 years and reside in Bothell, WA. I am currently working towards my Master’s Degree in Transpersonal Psychology. I was excited to discover the Am I Hungry? Mindful Eating Program recently because it complements my work perfectly. I work with individuals both locally at my office in Bothell, WA as well as online via Skype. I also host groups both online and locally. Thank you so much for this, it is so helpful!! What we resist, persists – that it such a perfect phrase to encapsulate this experience. 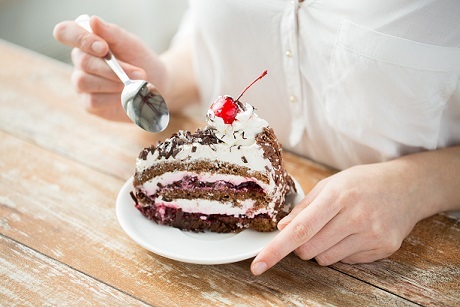 I’ve had trouble with emotional eating and the food rebel definitely kicks in if I try to restrict in any way, even taking a time out, if, like you said, there’s some lurking feeling that I CANNOT have the cake afterwards. It also seems to help me if, during the time out, I visualize eating the cake, imagining the taste of it, the frosting, etc. because ironically, it makes me realize, wait, it’s JUST CAKE. It’s not magical, it’s not sublime, it’s not going to solve all of my problems, it’s just…cake!!!! Isn’t that a beautiful realization to come to, Ariel? What an amazing experience of mindfulness you’ve shared, realizing that it’s ‘just cake.’ It’s amazing how just taking a step back and checking in and even visualizing can help us get such clarity. Thank you so much for sharing! Hit the nail on the head and I shouldn’t be surprised that I want to do this as it was all set up long ago, before I had that much training on how to reason and was just going on emotion. I love that you pointed out when this happens to approach it with curiosity. I’ve never tried that before so it should be interesting to see what I find out. So simple and since I tend to believe in finding a way through for yourself, very interesting to have a little ‘script’ to do so. I can do this. I’d love to hear how it is going for you as you become curious on your journey:) For me, curiosity is the magic ingredient! Hi, I have been working slowly towards this for about 2 years now, the biggest resistance I face now is from other people, but I am slowly working towards a place where I can face them and fight as I feel that most of the time, although I eat what I want, I eat if I am hungry. I have started exercising and loving it, something I never would have thought I would say before. I still struggle to stop before a plate is finished, but am slowly getting there and I still have a tendency to stop thinking when I am tired and use food instead of sleep, but it is no longer all the while and I try not to feel guilty. My weight has stabilised and started to reduce, it is very slow, but I feel I have only got more ‘able’ with this system and do not feel frustrated or angry or disappointed with myself anymore. As you said it is practice and it can take a while but give yourself the chance to get there in small steps if necessary. Thank you so much for sharing. I love that you said you feel more able and no longer feel frustrated, angry and disappointed. That sounds like true freedom! This is the practice:) You have done some amazing work! And the good news is, when you do it this way, the effects last a lifetime. I’m curious about what happens when you experience resistance from others. What kind of resistance do you experience?